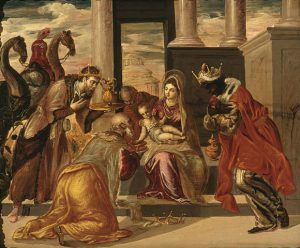 Epiphany or Three Kings Day is January 6 and as the Twelfth Night officially ends the Christmas season. It is a day to celebrate the baptism of Jesus and the arrival of The Magi (Three Kings or Wise Men). In the Middle Ages Christmas was celebrated from Christmas Eve to January 6. And Epiphany Day was a major celebration well into the mid 19th century when its importance diminished. The Catholic Church no longer requires January 6 to be celebrated as a solemnity and celebrates it on the Sunday that follows it. Some Protestant churches celebrate the Epiphany season from January 6 till Ash Wednesday. Orthodox Christians celebrate it on January 19 as they follow the Julian calendar. In many Spanish speaking countries, Dia de los Reyes (Three Kings’ Day)is celebrated with special foods and gatherings. Many European countries have their own unique observances as well. Children often gets treats or presents on this day. In Italy, La Befana flies through the night on January 5 on a broomstick to deliver gifts to good kids and give coal to the bad ones.